Since this time, it was not just the seasonal hair fall but some medical issues too that were causing the hair loss, I noticed that my hair had become thinner and less voluminous. So instead of the tried and tested L’Oreal force vector shampoo, I decided to try the variant specifically meant for thinning hair and hair loss – L’oreal Density Advanced Shampoo. Anyone with fine hair or suffering from hair loss and hair thinning. Possibly any allergy causing/troubling/or harmful ingredient? Mixed medicinal and floral scent. Very mild and gentle. Fades away quickly and does not linger after wash. Spread evenly through wet hair. Lather. Rinse thoroughly. Repeat if necessary. 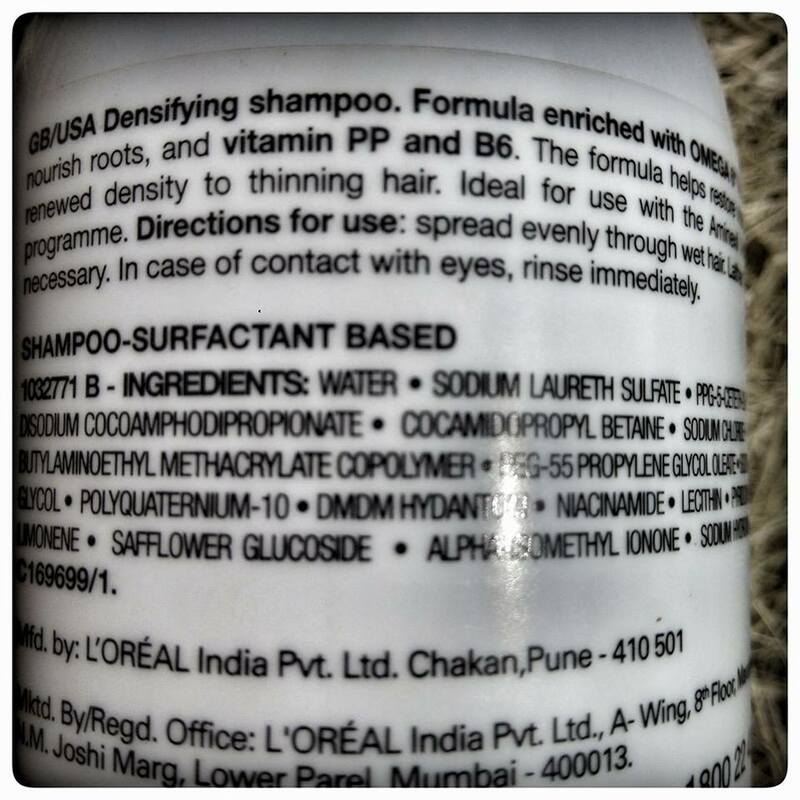 Like, all other Serie Expert variants, L’Oreal has kept the packaging of this shampoo quite simple. The shampoo comes in an opaque white plastic bottle with flip open cap. The bottle is airtight and travel-friendly. Everything you need to know about the shampoo is written on it. L’Oreal density advanced shampoo is basically a treatment shampoo for falling and thinning hair. Enriched with vitamins B6, PP & Omega 6 acids, the shampoo works to cover each hair strand with rich lipids for an increased diameter and refined texture, while moderately cleansing hair cuticles for strengthened body and shine. Hair look supremely nourished and managed with improved volume. Ideal for use with the Aminexil Advanced anti-thinning hair programme. I’ve been using L’Oreal Density Advanced shampoo for over two months now. Ever since I’ve had my baby girl, my hair have been on the thinner side, making it very difficult to create nice hairstyles. And especially from last few months due to the rainy season here in North India, they have become extremely difficult to manage with lots of frizz and shedding. No wonder, keeping a hairstyle in place with such fine and frizzy hair is a nightmare. But thanks to L’Oreal density advanced shampoo with the goodness of vitamin B6 and omega 6 fatty acids, my hair feels thicker. I don’t quite really understand the science behind of how it works or why it works, all I know is, it does leave my hair feeling thicker & fuller. Also, since my hair are fine and on the drier side, I wish my shampoos to be moisturizing and not contain any heavy silicones to weigh them down. L’Oreal density advanced shampoo delivers well to both these demands. My hair look thick, dense, and super soft to touch. Presence of sulfates and parabens! Besides a handful of good ingredients, the shampoo is full of chemicals. And the funny thing is despite containing SLS, the shampoo doesn’t lather well. True, excessive foam only works to strip off your natural oils but sometimes you do need that extra lather to effectively clean or remove all the gunk off your hair and scalp. This shampoo terribly fails at removing the overnight oil even after three washes! This is a big con for me. The other thing I didn’t quite much like about this shampoo is that I bought this shampoo with an expectation to reduce my hair fall issue. But I’m sorry to state it has not made any dramatic or drastic difference to my hair fall despite using this shampoo consistently for two months now. I wouldn’t. Besides giving me thicker hair, I also wanted this shampoo to reduce my hair fall, which unfortunately it couldn’t. But I like this brand, so I think, I would rather try some of their other shampoos that attempt to fulfill all my demands sans any cons. Yes, only if you have fine hair that are difficult to manage or suffering from hair fall that is not due to any hormonal, medical, or medicinal issue. But do give this shampoo a miss, if you have excessive dry or oily hair. 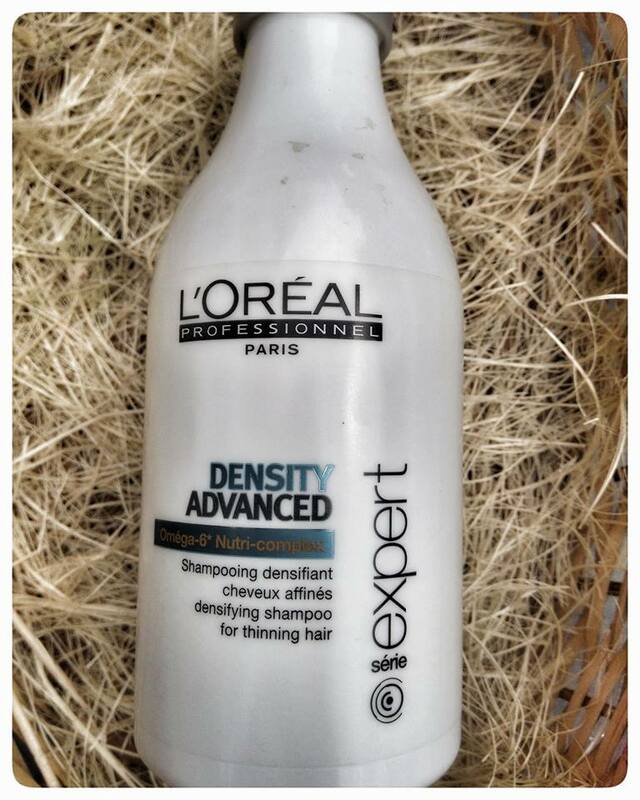 L‘Oreal density advanced shampoo is a decent volumizing shampoo that truly does give you thicker & fuller hair. To an extent, it also helps to reduce hair fall. May be, because my hair fall is a side effect of a medicine I’m taking, so this shampoo or any other hair product in such case naturally can’t help much. So on the whole, satisfied with density part, which was my primary concern.